It’s the ultimate jumping on point for new readers and a bold new beginning as Malcolm Dragon takes over the title role from his famous father. Malcolm Dragon is not your typical teenager. He lives in an apartment by himself in downtown Chicago, he’s a junior who’s just transferred to a new high school, and he’s trying his best to fill the shoes of his father, the Savage Dragon, fighting the forces of evil in the Windy City! New dangers! New adventures! 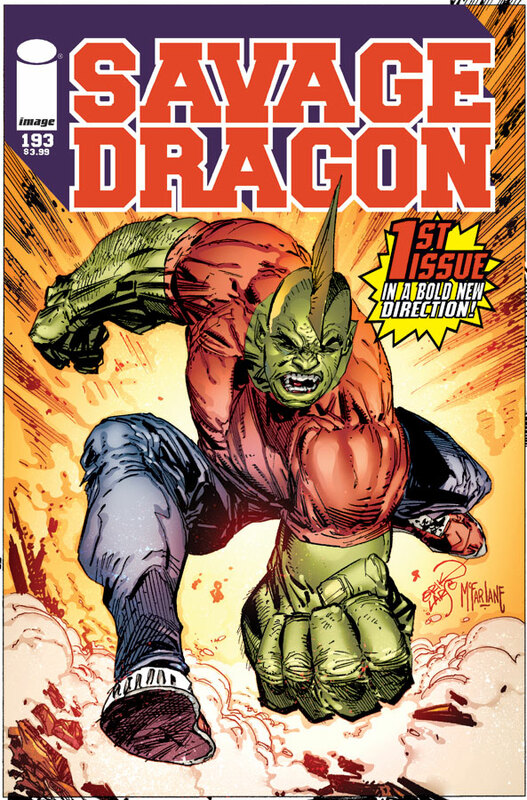 Get in on the ground level of a whole new SAVAGE DRAGON! Story-It’s Malcolm’s first day at a new school now that he’s living on his own in an apartment. At school the girls try to throw their bodies at him and the guys try to forcefully become his friend all because he’s a celebrity. On his way home he has to deal with a potential stalker before aiding the police. At the end of the day he visits his incarcerated father. 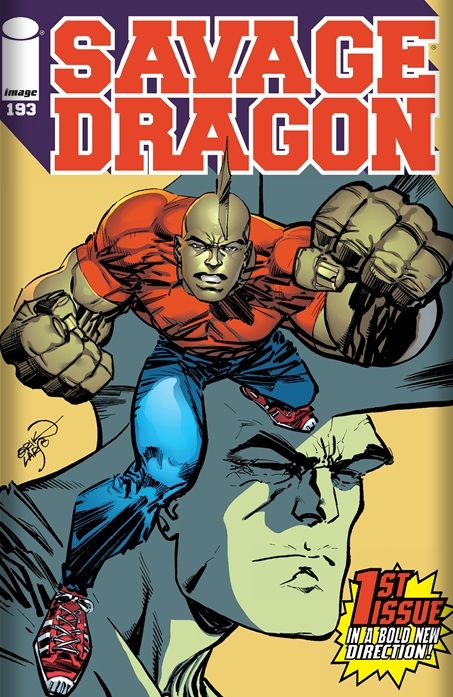 Cover– A very nice cover from creator Erik Larsen; Savage Dragon is in the background while Malcolm is in the foreground striking a pose, a la power rangers. The alternate cover is rendered by Todd Mcfarlane of Spawn/Spider-man fame and it too is glorious! Celebrity– I think Erik Larsen has captured what it’s like to be a celebrity teenage superhero in today’s society. The ogling at school, the inappropriate questions, the forceful ‘wanna be’ friends, it was all handled very well. Larsen has always handled the human moments very well in Savage Dragon it’s good to know he still has it. Black Hero– Malcolm Dragon is here front and center and looking more like his father than ever. Art– Courtesy of Erik Larsen in his famous trademark style. It’s a love it or hate it style but I’ve always found his work on this series his very best. Action- Despite great character moments Larsen then squeeze in an action scene filled with fists, blood and bolts of electricity. Action junkies should be quite happy. Accessibility– By moving Malcolm to a new school and location Erik is clearly trying to provide a jumping on point for new readers. For the most part it does work though longtime readers will get far more from this book. There are subtleties of Malcolm’s recent problem with his Asian girlfriend or the fact that his black girlfriend the one who came before the Asian got pregnant for his sister’s boyfriend. Hmmm- Why is there all this buzz over Malcolm taking over this book from his dad? This title has been Malcolm’s since issue #169? I’m a fan, papa Dragon has not been the star in quite awhile.